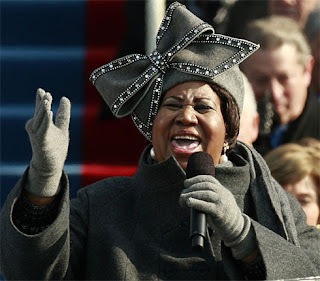 Had everybody telling me how much they liked the hat Aretha wore at President Barack Obama's inauguration. I think it looked terrific and I am (as everybody else is) doing a version so stay tuned. Think at this stage my hat will be a toned down version as not everyone has the ability to carry off such a large hat - as Aretha does so well. Thought I would show you a headpiece I made during the Spring Racing Carnival here in Melbourne - had almost forgotten (how can that happen?) that I had made this till I saw the photo's again lost in my huge photo file. An interesting look and very 'vintage' I like the bow at the back adds a lot to the design.